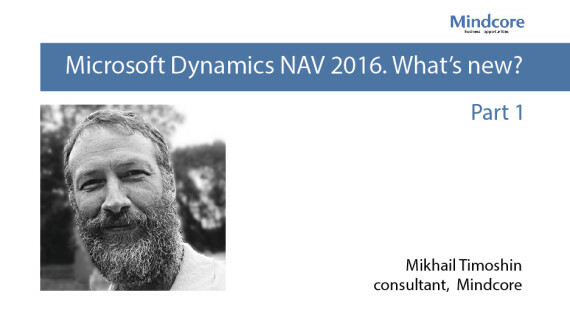 Microsoft Dynamics NAV 2016: what’s new? Part 1. The ability to preview operations before their accounting is, strictly speaking, not new: it was realized by Moscow office of Microsoft Business Solutions (MBS). However, implementation was not devoid of some “childhood diseases”, to which they apparently did not get around to fix. And now, you are welcome! Now we have this option in the international version, which means that errors will be corrected more quickly and finalization itself will evolve with the system. Let me remind you that the functionality of the Operation preview before the accounting allows you to run accounting procedure in an operations preview mode to make sure that the financial accounting goes as we expect it to. If anything goes “with a flaw”, you can simply adjust the settings or correct the documents and perform accounting again. Another gift from Microsoft – a functionality for accounting FE (future expenses) depreciation. This issue could be solved before, but in course of doing it one had to adapt the accounting the FA (fixed assets), which seemed somewhat makeshift. Now functionality to write off the costs incurred for the payment of various kinds of licenses, declarations and other things, is available “from the box”. Everyone solved this problem, until recently, on their own. Starting with one of the “classic” version of NAV, appeared the development of MBS. In fact, this functionality was working properly, but in the international version it was brought to perfection: the possibility to set on virtually any data format with currency exchange rates was created. The undisputed benefit that exchange rates could be downloaded not only from the CBR website but also from any other service, for example, Yahoo.com, or the European Central Bank. This functionality is in demand among international companies doing business in different countries. The possibility from category “a trifle, but nice.” There are customers who establish their own demands for their suppliers to waybills or invoices. Retails network were always “notorious” in this kind of matter One had to have several reports in the list of printed forms and manually select the desired. Now the “personal” reports are assigned once to the cards of the right customers and do not require special attention and, therefore, occasional errors (for example, the bill is printed in the wrong format) will no longer cause a headache to bookkeepers awaiting the corrected documents.